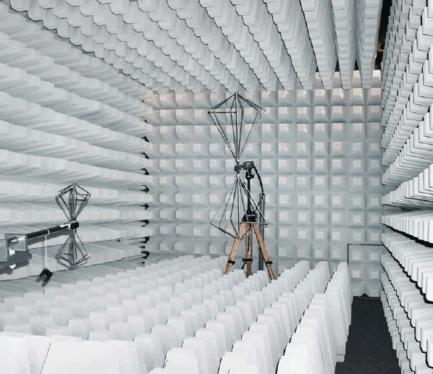 Our range of high-performance compact semi and fully anechoic EMC chambers offer radiated emissions pre-compliance and radiated immunity full-compliance solutions. Compact EMC chambers are economical alternatives, both in terms of cost and space when compared to full-size chambers, whilst maintaining a high degree of measurement accuracy (see specifications datasheet for full performance details). 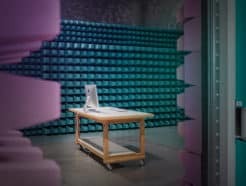 The pre-compliant fully anechoic room (FAR CDC) is well suited as a test site for tabletop EUT. Cost reduction is achieved through the efficient design for the FAR CDC. 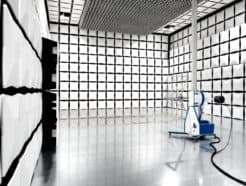 Fixed antenna height and floor absorber layout covering the entire frequency range are all contributing factors in the reduced measurement and set-up time. 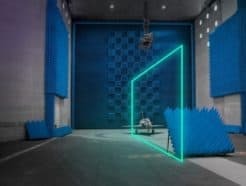 The pre-compliant semi-anechoic chamber (SAC CDC) is well suited as a test site for floor standing and heavy EUTs. The ground plane turntable design can easily carry loads up to 1 t (2,205 lb). Due to the height limitation, the scanning range is limited to 2.1m (6ft). 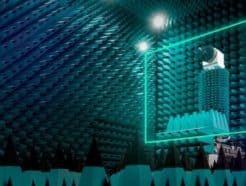 The excellent NSA performance of this chamber is one of many great reasons to choose this version of a pre-compliance chamber. 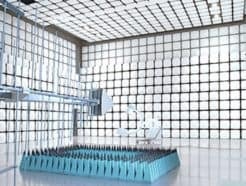 For all of our compact EMC chambers, options and customization services are available. Contact us to discuss your specific requirements.